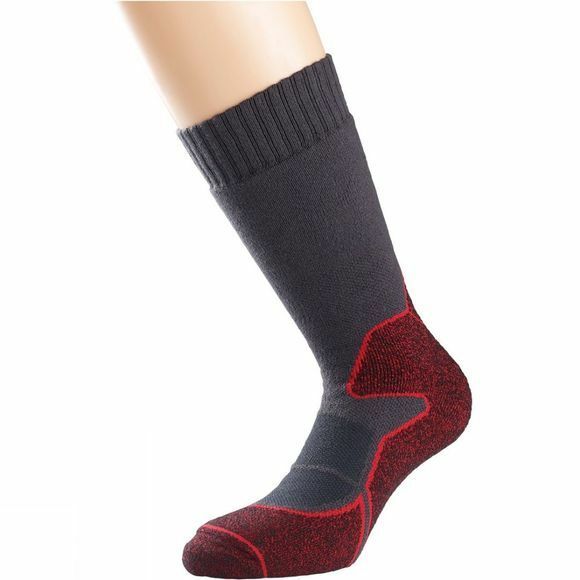 The Womens Heat Walk Sock from 1000 Mile uses the unique Nilit Heat yarn from it's inner layer to warm the wearer for maximum comfort and performance during the cold temperatures. All-over padding increases warmth and protection for the foot and leg whilst the wicking, breathable inner layer provides a sweat-free sensation for maximum comfort all day long. Top venting on the foot allows the foot to breathe and helps maintain an even temperature. Double layer construction eliminates friction between foot and shoe, reducing wear and helping to prevent blisters. Captures body heat naturally for exceptional warming. Excellent absorption and moisture control for a sweat-free sensation. Natural anti-bacterial properties and a powerful deodorising effect. Environmentally friendly yarn–created with coffee charcoal which makes use of the natural surplus from coffee bean shells and integrates into the nylon fibre for a natural insulation. This product contains Merino Wool: Merino wool is one of softest types of wool available and is perfect for regulating body temperature. The wool provides warmth without overheating the wearer and it's moisture wicking properties combined with being slightly moisture repellent allow the wearer to remain dry.